Here I'll try to explain the meaning of colours in Auras and the Orange Aura in particular. The Aura colours that surround an individual can reflect their character and personality traits and point to their future destiny. Many have studied the Aura colour meanings and Psychics can detect the predominant Aura colours surrounding someone. People with orange in their Aura are gregarious, generous, social souls. They love to be in the company of others and don't mind being the centre of attention or just another face in the crowd. They tend to have many friends and are well liked because of their enthusiastic nature. They do not like to be on their own for too long, preferring instead the company of others. They want to please others and are often the best gift givers, being very thoughtful and generous. People with orange in their Aura tend to live in the fast lane. They are fast moving and fast talking people who like to grasp opportunities. They are very spontaneous and impulsive. They have an abundance of energy and enthusiasm. They have the ability to energise and motivate others because of their natural enthusiasm and positive energy. they are very adventurous and daring and will try anything at least once. 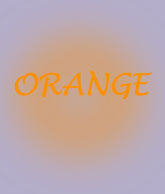 The Orange Aura individual is normally good-hearted, kind and honest. They are very attuned to the emotions of others and can sense and feel their pain and joy. Orange Aura people can be very charming, but part of their charm is in their sensitivity to others. They have the ability to make everyone feel at ease in their company. People with orange in their Aura can be hot headed and quick to lose their temper. But on the positive side they are equally quick to forgive and forget if a sincere apology is offered and accepted. They do not hold grudges. Having predominantly orange in an Aura means a person is confident of the impression they make on others and can use this to their advantage. They tend to lead very successful and happy lives. On the down side people with orange in their Aura tend to be impatient and tend to rush into projects, relationships and experiences too quickly. They normally need to act immediately and consider the consequences later. They tend to start projects but lose interest too quickly and fail to finish them. They can also make rash, ill thought out decisions which can have challenging consequences.